DO-17040-10 was succesfully added to your cart. All measurements reported are traceable to SI units via national standards maintained by NIST and performed in compliance with ANSI Z540, ISO17025, and MIL-STD-45662A. InnoCal is accredited to ISO/IEC 17025 by the American Association for Laboratory Accreditation (A2LA) under certificate number 1746.01. This accreditation is your assurance that the calibration is performed in a qualified, controlled laboratory.Calibrations on pressure and vacuum gauges are performed using direct comparison against ultra-precise quartz reference transducers. Pressure measurements can be taken up to 20,000 psi and vacuum measurements down to 29.2 inches of Mercury. The calibration consists of 5 points upscale and 5 points downscale across the range of the instrument. What would be the calibration duration for the Digital Pressure Gauge, Item# RK-68950-35 when Item# RK-17040-10 is used. Asked on 1/9/2015 by Adam from Vancouver, BC Canada. 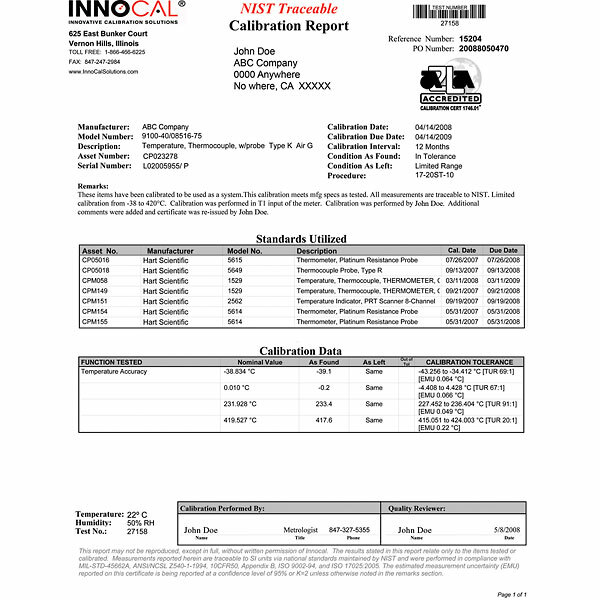 The calibration interval can be specified by the end user. The default interval is 12 months. Annual calibration is recommended. Does this calibration come with certification and test data? Yes, full before and after data is supplied in this "long form" report. Good! Just need faster return.